The faculty of Pharmacy and Drug Manufacturing organized a trip to Cairo in collaboration with the Student Activities Administration on Friday 17/3/2017. After being gathered at Pharos University, the students headed for Cairo at 7 a.m. 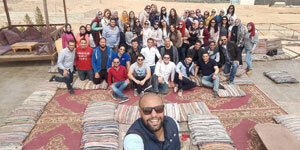 The students started the program at Saqqara burial ground in Nazlet El-Saman, then they went on a Nile cruise. Afterwards, the students headed towards Muizz street and Khan el-Khalili district.